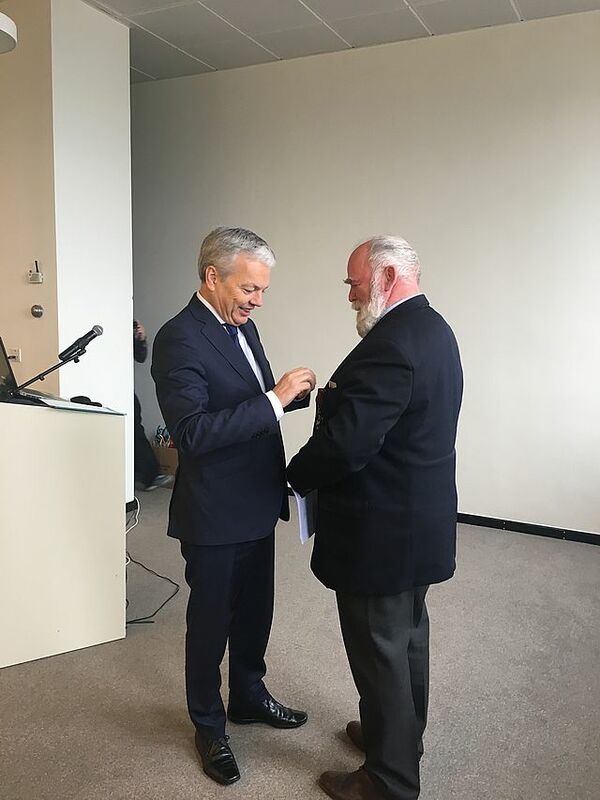 On 10 December 2016, Jan de Graeve, member of the Executive Committee of the Brussels Map Circle, received the Belgian Ordre de la Couronne / Kroonorde with rank of Officer from the hands of Didier Reynders, Belgian Minister of Foreign Affairs. The ceremony took place at the Royal Library of Belgium, during the Brussels Map Circle’s International Conference on Globes and Instruments, after Jan's lecture on Scientific measuring instruments in the 16th century. More details here. "Jan de Graeve receiving the Belgian Ordre de la Couronne / Kroonorde with rank of Officer from the hands of Didier Reynders"
Issue 97 (Winter 2016), consisting of 84 pages, was published in November 2016 and is in distribution to all paid subscribers and members in good standing of the Washington Map Society. Copies are available for purchase. This thrice-yearly journal with articles on maps, the history of cartography, and exploration is the only journal of its kind in the Americas. John Rennie Short explores the modern national atlas. Petra Svatek discusses academic cartography at the University of Vienna from 1848-1900. Harold Meinheit explores an 1838 map of Vietnam by Bishop Jean-Louis Taberd being used in national disputes today over the Paracel Islands. Gunnar Thompson proposes new information about the North Atlantic, and especially Newfoundland. James Goode concludes a four-part series highlighting treasures in the Albert H. Small Collection of Washingtoniana. Bert Johnson provides an early look at the coming July 2017 International Conference on the History of Cartography. Dr B. J. Vannieuwenhuyze (1980) has been named professor by special appointment of Historical Cartography at the University of Amsterdam (UvA)'s Faculty of Humanities, effective 1 September 2015. The chair was established on behalf of the Cartographiae Historicae Cathedra Foundation. A close partnership exists between the chair, the Explokart Foundation and the Special Collections division of the UvA's Library. Bram Vannieuwenhuyze studied history at Ghent University, where he obtained his doctorate in 2008. He has worked as a postdoctoral assistant in Ghent and Leuven, and is currently a freelance historian in academic projects that mostly deal with historical cartography and urban history. His inaugural speech was held on Friday 23 September 2016. Those who speak Dutch can watch the footage here. Just published by Peeters Publishers in Louvain, Belgium in the Collection Turcica. Year: 2016, ISBN: 978-90-429-3185-5, Pages: XVIII-406 p.
Edward Said voyait dans l'orientalisme allemand un seul fantasme de cabinet: à rebours de cette conception, cet ouvrage montre qu'il se nourrit aussi d'expériences de terrain. Comment ? Il redessine la toile des producteurs - concepteurs, réalisateurs, traducteurs, commanditaires - des cartes de l'Asie mineure publiées à Berlin au XIXe siècle. Apparaît alors une géographie savante transnationale: de Péra à la Wilhelmstrasse, de Trébizonde à Leipzig, de Smyrne à Paris, Londres, Saint-Pétersbourg ou Vienne. Les producteurs autochtones et étrangers d'un savoir sur l'Empire ottoman circulent, se rencontrent et correspondent. La cartographie est au centre de l'attention des orientalistes savants, des hommes d'affaires et des militaires. C'est un sésame pour la philologie, l'archéologie, l'art de la guerre et le commerce. Entre 1835 et 1895, période que jalonnent les deux principales missions militaires envoyées par Berlin dans l'Empire ottoman, les intérêts stratégiques et académiques s'imbriquent et évoluent conjointement avec les projets militaires et civils ottomans. Rouage d'une histoire transimpériale, la cartographie de l'Asie mineure ne fut pas un simple vecteur d'un impérialisme allemand mais bien un outil au service de deux empires. Seller's draught of Cape Bona Esperanca: deliberate Dutch disinformation? Our readers may remember the publications on Monaco by Rod Lyon, an active member of the Malta Map Society and formerly engaged as expert in ancient maps and engravings by a leading antiquarian dealer in Monte Carlo; after articles in our Newsletter No 37 (May 2010), he had produced a little book presenting the sum of his research over thirty-five years on maps of Monaco (see Newsletter No 48, January 2014). A new edition of 'Monaco autrefois [Monaco in the past] – old maps, charts and plans of the Principality of Monaco (1640 – 1879)' has just been issued: hardback, 88 pp. fully illustrated in colour, with more maps and expanded texts. Its larger format (A4) makes it an attractive book to view reproductions of all the maps in the book. The book can be ordered (at EUR 50.00) from the author: Rod Lyon, 28 Triq is Sikka, Bahar-ic-Caghaq, Naxxar, Malta GC (28triqsikka@gmail.com). It is a tradition in Brussels: the Royal Palace opens its doors to the public, every summer. Visitors have access to certain rooms of the palace, and to exhibitions taking place there for the occasion. This year one of them is about cartography and displays a number of old maps (none are very ancient) and related objects and instruments, illustrating the place and use of cartography in our world (see http://www.cartographiae.be which gives the contents, with commentaries, of the cartographic exhibits). Wulf Bodenstein, who is not only the founder of our Circle but also (benevolent) curator of the historical map collection of the Royal Museum for Central Africa in Tervuren, provided the three items from the Museum plus texts. He was duly rewarded by the privilege of a toast in royal company at the vernissage of the exhibition on National Day (21 July)! Our friend Francis Herbert turned 75 this past 25 July. He participated in the inaugural meeting of the then BIMCC (31 March 1998) when he was still Curator of Maps at the Royal Geographical Society and he has been a regular Speaker and participant in our many events since then, including the recent excursion to Rome last April. He has engaged himself 100% as a member of the editorial committee of this magazine since last year and is a solid supporter of our Circle. As you know, he is a living carto-bibliographical encyclopedia, a unique species in the map world. And he is relentlessly helping everybody around the world who comes up with an interesting question to fill their knowledge gaps, large and small. He received the IMCoS Helen Wallis Award in 1995, quoted as 'probably the most helpful map librarian in the world'. By that time he had compiled the Imago Mundi bibliography for 20 years – an immense piece of work, if you have ever gone into it. Emilio Moreschi, President of the Associazione 'Roberto Almagià' is glad to inform that the exhibition is extended to 25 September 2016, confirming the maps loans.